With over 40 years experience in the industry, Decleor continues to drive their vision for perfect beauty by being the trusted experts for aromatherapy skincare. Beauty, and in particular skincare is built on the trust between customer and brand, thats why Decleor only use natural, pure ingredients when they put their solutions together. What type of products do Decleor sell? Decleor sells beauty skincare in many different forms, popular products include their body creams, fake tan solutions and face cream. However their vision is felt in every single product they sell, a dedication to quality means no one product should let you down. 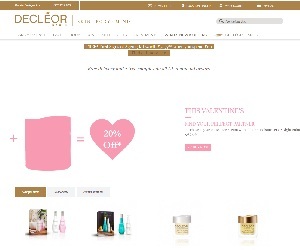 Which popular brands do Decleor sell?